Two-sport star will be a junior at the Cache Valley school. (Trent Nelson | The Salt Lake Tribune) Payson vs. Sky View, 4A State high school basketball tournament at Utah Valley University in Orem, Thursday March 1, 2018. Sky View's Mason Falslev (1) celebrates a large second half lead. 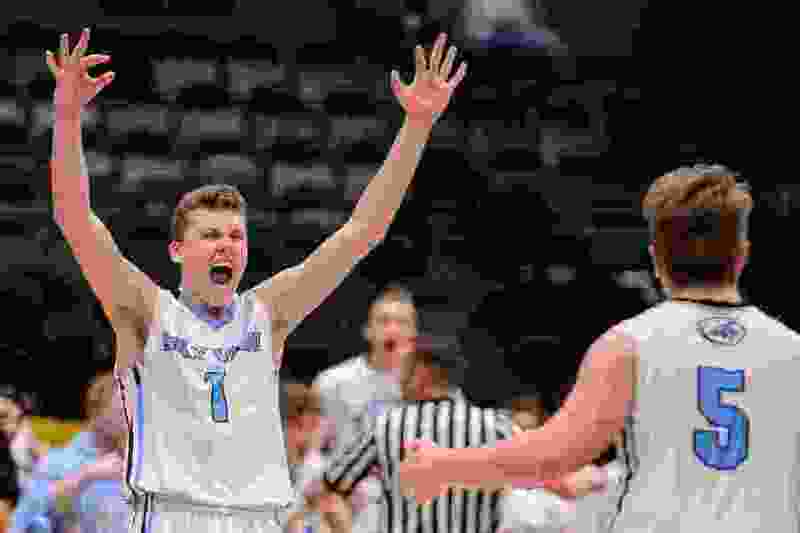 Mason Falslev, Sky View High School’s outstanding two-sport athlete, has committed to play basketball for the University of Utah, he announced Saturday. The 6-foot-3 point guard is a rising junior in Cache Valley. He averaged 20.8 points and shot 54 percent from the field, according to The Herald Journal of Logan and is playing AAU basketball this summer for the Exum Elite Utah Prospects team. Falslev scored 43 points against Highland of Idaho and posted 38 points and 13 rebounds against Cache Valley rival Green Canyon. Falslev also starred as a receiver for the Bobcat football team that reached the Class 4A semifinals in 2017. If he goes on a church mission, he would join the Utes in 2022. The Utes have a commitment from a point guard in the class of 2019, Olympus' Rylan Jones. Utah is still in the picture with Nico Mannion, one of the country's top recruits. The son of Ute alumnus Pace Mannion soon is expected to reduce his list to five or six schools. Utah made the cut to six schools for American Fork forward Issac Johnson, along with BYU, Gonzaga, Ohio State, Stanford and USC. Johnson intends to enroll in 2021, after a church mission.